The most difficult part of the images I create is thinking of a most suitable title.Luckily I came up with one for this one. 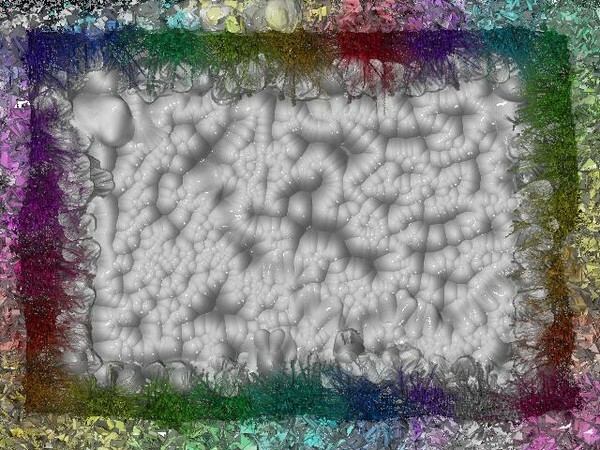 Artist Reply: Hi Maggie, All my digital images and improvisational and I never know what the out come is going to be.The difficult part is usually titling the image.Naturally when I looks at the result the most obvious thing is what looks like brains. As with other images I've created here I've started the image with the border. To me Correct Titling is very important and seems to be a skill in its self. SOMETIME YOU NEED A BRAINSTORM TO COME UP WITH A TITLE. YOU'VE GOT IT.